A sweet homemade nectar like pear honey that makes wonderful gifts, especially during the holidays. Pear Honey gets it's name "honey" by the color it turns after it's prepared. This pear honey is wonderful spread on toast or biscuits. Today I tried my hand at making Homemade Pear Honey. I have to say it was easier than I thought it would be. The hardest part was peeling and chopping all those fresh pears. I've been wanting to make pear honey ever since I got my first taste of it at my mother in laws house. She had a jar hanging out in the refrigerator, so I added some to my toast and it was love at first bite. I asked her where in the world she got that jar of homemade pear honey? She told me that it was given to her from her friends grandmother. I wondered if she could get the recipe, but she told me her friends grandmother was in ill health and wasn't canning anymore pear honey. It was on that day that that I began my hunt for a tried and true pear honey recipe. A couple days ago my oldest son had brought me a big bag of fresh pears that his grandmother had gave to him to give to me. I was shocked at all those pear and wasn't sure what to do with all of them. I immediately thought of that delicious pear honey. We ate a few of the pears just because we couldn't resist and saved the rest to make pear honey. I had remembered seeing a recipe in Paula Deen's "Lady & Son's Cookbook" for pear honey. It was a simple recipe that wasn't filled with crazy ingredients, just pears, sugar, crushed pineapple and lemon juice. 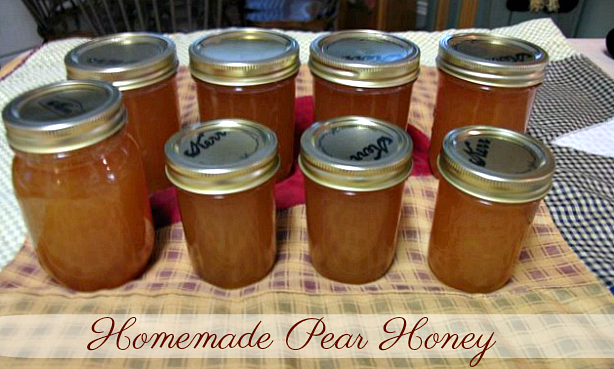 I've been wanting to get a jump on canning to use as gifts for the upcoming holidays., so this pear honey is perfect. These are the ingredients you will need: Fresh Pears, Crushed Pineapple, Lemon Juice, Sugar and a little patience. Start by peeling and chopping the pears. I pureed mine in a blender for a few seconds since the pears were so firm, then added them to a large pot. Add the sugar and crushed pineapple. Add the lemon juice, and mix to combine. Bring the pear mixture to a full rolling boil, reduce heat and simmer until the pears are tender and the mixture starts to thicken up (approx 30-40 min). If the mixture doesn't thicken up you can add about 1 tablespoon of pectin. Ladle the pear honey immediately into prepared (sterilized jars), filling to within 1/8 inch of the tops. Wipe jar rims with a clean cloth. Add the lids and rings and screw bands tightly. Place jars on elevated rack in canner pot. Lower rack into canner. (Water must cover jars by 1 to 2 inches. Add boiling water, if necessary.) Cover; bring water to gentle boil. Process pint size jars for 10 minutes and half pints for 5 minutes. Remove jars to a towel to cook and listen for the tings of the lids sealing. Let cool before storing in pantry. Mix all ingredients and bring mixture to a full rolling boil. Reduce heat and simmer until the pears are tender and mixture thickens, approximately 30 minutes. If the mixture does not thicken you can add about one tablespoon pectin. Ladle the pear honey immediately into prepared (sterilized jars), filling to within 1/8 inch of the tops. Wipe jar rims with a clean cloth. Add the lids and rings and screw bands tightly. Place jars on elevated rack in canner pot. Lower rack into canner. (Water must cover jars by 1 to 2 inches. Add boiling water, if necessary). Tina! You make that look so easy! It also sounds so yummy. It would make great Christmas gifts. I am going to try that this weekend. I will let you know how it goes. I have never been a canner. I wish I was! That pear honey looks so delicious!! I wish i was a canner too. You certainly have quite a few coveted recipes. Yummy! I agree, You do make canning look super easy! You almost make me want to start canning!! My mom made this a few years ago and it's so good. I love it on hot biscuits. Thanks for sharing. I've never had pear honey, but I've heard of it before and it sounds so wonderful! Yours looks so great in the jars, very beautiful. Tina, I like this recipe. I should go out and buy the cookbook. It's one I don't have. Isn't Paula cool? She drives me crazy sometimes, but I like the way she cooks. Did you get her chocolate magazine? It's filled with some really great recipes. Oh yes Teresa i have Paula Deens Chocolate Magazine. I adore that womans cooking. Thank you soooo much for the honor of sharing the link from my blog on the pear honey post. What an honor that you featured it. Nichole you are welcome. I wanted everyone to know that you can make this wonderful honey with canned pears as well, so you deserve the credit for that recipe. I am glad you stopped by and were pleasantly surprised. Oh man this looks good. I have never had it but I want to make some :)..
Good job on the pear honey Tina! Yum! Thanks for visiting me, too! I just found your blog and I love it!! All of your recipes are so simple...makes it sound like anyone can do it!! Thanks! Nice job! I had never made this before but had several friends who's Mom/Grandma/neighbor, etc., had. But noone had a recipe so I started googling. I found several like this but I wanted to can my pears and use the leftovers. I found a recipe at a pick your own fruit site that used the sound peelings and cores of the pears. It worked great! One friend said it tasted just like his Mom's (she had died a few years before and it was a taste of happy memories for him). So, I got my cake and ate it too - or got my pears and pear honey too! Now, since I don't enjoy peeling pears and I have enough canned, I am making pear honey with the whole, sound, unpeeled pears, just cut in pieces and plan to put them through the food mill for more pear honey, with less number of pears than the recipe calling for peels and cores alone. Thought I'd pass on another way to use you pear "waste"! Have a great day! What type of pear did you use? Bosc or Bartlette? I am not sure on what type of pears they were. The pears were given to me from someones tree and she did not know what kind they were. Thanks for the recipe, I'm really excited to try it :) Also, my husband and I have been going crazy looking for the Jell-O Pudding pops in stores and I was so happy to see your recipe here. I'm going to try making them today! Maybe its a silly question but... properly canned how long should pear honey last on the shelf? I'm wondering if I can make this a whole year in advance... i'm considering making it now for my 2012 summer wedding as favors. I've never done canning before - i know jelly and such can last a long while.. how about this? properly canned good last for up to a year in your pantry unopened. Found your blog by investigating making pudding pops for my son. Used your recipe and also tried the yogurt pops we used raspberry and peach for our pop. I have to say the pudding pops turned out great as did the yogurt pops. Our four year old son really enjoyed helping as well as eating them (so did mommy and daddy). The other comment I wanted to make was you inspired me to try canning for the first time and I loved it. We have a wonderful pear tree in our yard that always produce tons of pears and I never know what to do with them and then while going through your blog I saw the Paula Dean recipe for pear honey. I had to try it. THe canning went great (i only burned my finger on a hot jar once :)I was really nervous about it but your directions are so straight forward and step by step I love it. I also love that you but pics of each step. Anyway.. Just wanted to let you know your blog inspired me to try something I have been wanting to try for years but was very trepidacious about trying canning. It was not bad at all, and I will be cannning again, I'm thinking homemade jams, jellies or honey will be great presents for the end of the year. Again thanks for your blog and the simplicity of the recipes. I like this recipe but have a question. I have several sugar pear trees can I swap sugar pears if so do I need to cut down amount of sugar since the sugar pear is so sweet? I only used 3 cups of sugar and 2 cans of crushed pineapple. it turned out awesome. I have another recipe that says it has to season for 2 to 6 weeks....is this necessary? thanks. Thanks for the awesome resipe, I had never tried pear honey but with two boxes of pears I have been trying anything to get them used up and this was delicious! I just have one suggestion, you aren't supposed to push the lids of your jars down. You should let them sit for 12-24 hours and if any of the jars haven't sealed (the lid should pop down on it's own) replace the lid and repeat the boiling process. If it doesn't seal on it's own that means you have an improper seal and the contents of the jar will probably go bad. Woo Hoo!! A great way to keep the pears and get the family to eat them!! Super easy. OK, I guess this is a dumb question, but how much is "a little bit of pectin". I have my pectin, but how much should I add. Perhaps a teaspoon full or so? Thanks, I'm trying this tomorrow. Hope it's how my Mom did it, because I sure can't find her recipe. Boo Hoo. Could I just make this the same way and freeze it? Have you tried freezing it? I'm not really set up to make or store canned foods properly but I have lots of freezer space and freezer jam jars. I freeze apple butter and it comes out great--this seems similar so I'm hoping it'd be OK. I have never frozen pear honey, so I cannot tell you how the results would be. Tina, I made Pear Honey today. I have never had this before and it is awesome! I followed your directions to the letter and it turned out great. Thanks for sharing. Just made the pear honey. I used half brown sugar half regular sugar. Simmered for about two hours stirring most of the time. It came out a beautiful dark amber from the brown sugar but very clear and the thickness of honey when put on a cold spoon. From some of the comments I read people were looking more for a pear butter. Use this just like you would use honey. I wanted to raise honey bees but I am allergic. Now I have a source for honey that won't kill me! Thanks so much. I just want to say that you don't have to peel pears. You put them in a hot water bath just like peachs except you don't leave them in the water as long. They turn out beautiful. Better than peeling them as they are smoother.I have been doing this for a long time. Hope this helps people to be able to can or fix pears easier. I do have my grandma's recipe and in her comments at the end of the recipe she says to make sure to not overcook it or it will turn to sugar. I made too big of a batch to fill them quickly enough and several of my jars did turn to sugar after they had been open for a while. great recipe! This looks amazing. I want to try it. I love pear preserves, so I know this will be awesome. Thank you for sharing. Do you have to put in a canner? You said for 10 min. Paula Deen did not put in canner. I've made pear butter, wanted to try pear honey.